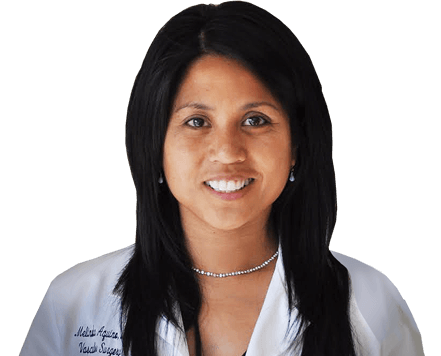 Melinda L. Aquino MD is a vascular surgeon serving the San Francisco Bay area. She is board certified in vascular surgery and general surgery. Dr Aquino is dedicated to helping patients look and feel better while improving and preserving vein health. Her assessment of patients involves a detailed analysis utilizing medical history, a careful examination, and often an ultrasound examination. This detailed information and Dr. Aquino’s years of experience help her formulate an optimal treatment plan personalized for each patient. Dr. Aquino completed her undergraduate degree at Georgetown University and her M.D. at Indiana University School of Medicine. She completed her general surgery residency at Boston Medical Center (Boston University) and continued as a Smithwick Fellow of Vascular Surgery, training under James Menzoian, MD. Dr. Aquino went to Eastern Virginia Medical Center to do a specialized fellowship in endovascular surgery. She has been serving the Bay Area including San Francisco, San Mateo, Marin, and the East Bay since 2006. Dr. Aquino is a member of the Society for Vascular Surgery, The San Francisco Marin Medical Society, and the San Francisco Surgical Society. Dr Aquino writes a variety of blog articles every few months. She typically writes these articles based on questions her patients ask. Feel free to check them out.